This fragrant Indonesian fried rice dish is the perfect weeknight supper for spice lovers. 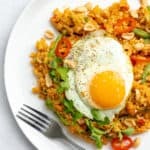 This nasi goreng recipe is packed full of goodness, veggies and is ideal for using up any leftover rice. Healthy, GF & vegan option. Add the rice into a pan of boiling salted water and simmer for 18-25 minutes until just tender. Drain and set aside. Meanwhile, make the sauce. Add all the ingredients into a food processor and blend until smooth. Heat the oil over a medium heat in a large frying pan/wok and add the onion. Fry for 5 minutes stirring constantly until softened. Then add the green beans and red pepper to the pan. Give everything a good stir and continue to cook for 7-10 minutes until all the vegetables are tender. Add the sauce, cooked rice and grated carrot to the pan and whilst keeping everything on the move, cook until the rice is piping hot. To serve, divide the fried rice between bowls and top each one with a fried egg, extra roasted peanuts, a sprinkling of sesame seeds and a scatter of red chilli. Enjoy whilst piping hot. This recipe generously feeds 4. Once cooled, any leftovers can be kept in the fridge for up to 4 days. Just reheat over the stove with a splash of water until piping hot. If you love spicy food you may want to leave the seeds in one or two of your chillis. Before making your decision, taste a little section of each chilli to gage how hot yours are. Remember you can always add chilli flakes/extra fresh chilli at the end, but you can't take it away! Personally I prefer to dry roast my peanuts myself but you can also buy them roasted if you are short on time. To roast your peanuts just cook them in a 160°c fan/180°c/350°f oven for 15-20 minutes until browned. Gluten-free: Use tamari rather than soy sauce. Vegan: Use maple syrup rather than honey. You can make this nasi goreng without the egg on top, but if you would prefer a m0re substantial dish, add in some chunks of tofu to fry at the same time as the green beans. I like the nutty flavour that brown rice brings to this recipe, but you could use white basmati rice is you prefer. Remember to adjust cooking times accordingly. If you can find it, try to use raw honey as it is less processed. If using maple syrup make sure it is 100% maple syrup and not maple ‘flavoured’ syrup. You could also use agave nectar if you prefer.